Growing up on the Gila River Reservation in Arizona, Ira Hayes was a quiet, shy boy. He never wanted to be the center of attention, and at school he often felt lonely and out of place. By the time Ira was in his late teens, World War II was raging. When the United States called its men to arms, Ira answered by joining the Marine Corps. He believed it was his duty to fight honorably for his country, and with his Marine buddies by his side, Ira finally felt as if he belonged. Eventually they were sent to the tiny Japanese island of Iwo Jima, where a chance event and an extraordinary photograph catapulted Ira to national awareness and transformed his life forever. Filled with all of the patriotism and tragedy of wartime and its afteraffects, Quiet Hero: The Ira Hayes Story is the story of one person's courage in the face of both military and personal battles. It is a poignant tribute to Ira Hayes—a man who was considered a hero by everyone but himself. S. D. Nelson decided to write a book about Ira Hayes because he felt it would offer important lessons to young readers. "Ira was an extremely shy boy whose photograph appeared in every newspaper in the United States. Ira Hayes helped win the war in the Pacific, but sadly, he lost his personal war with alcoholism," Nelson says. "The lesson is that people who develop addictions sometimes are ashamed and deny they have a problem. They do not have to fight addiction alone, they can ask for help. As in Ira's case, without treatment, addiction destroys lives. Since Nelson both wrote and illustrated the story, he conducted a great deal of research for the project. "First I went to the library and read all of the books and old newspapers that I could find," the author says. "I also traveled to the Gila River Reservation, where Ira was born." Nelson felt it was important to get a sense of who Ira Hayes was as a person. "In particular, I studied what Ira's friends and family said about him. I watched all the film clips available and searched the Internet extensively." S. D. Nelson felt that telling Ira Hayes's story was a challenging, but important endeavor. "Parts of Ira Hayes's story deals with the harsh but real subjects of war and alcoholism. It was a challenge to present these topics in a way that parents and teachers would find appropriate for young readers," Nelson comments. "I hope I succeeded with my words and paintings because I believe Ira's story is worth telling." Throughout the course of his research, Nelson uncovered much about the quiet soldier who by chance became part of one of the most famous moments in American history. "I was surprised to learn that Ira was so shy, many people did not even know what his voice sounded like. I also learned that he managed to go for periods of time without drinking. But Ira felt a terrible emptiness," Nelson says. "I also learned there has been much progress in the treatment of alcoholism since the 1950s —treatments that perhaps could have saved Ira's life. S. D. Nelson says his favorite part of Quiet Hero: The Ira Hayes Story is the bittersweet ending. "I like knowing that the spirit of Ira Hayes is not alone. Instead, he is united with his Marine buddies in a colossal bronze statue….Together this mountain of men raise the American flag in glory for all time." 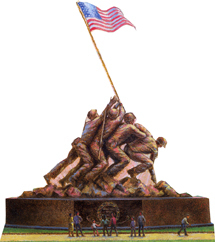 When asked what he hopes that readers will take away from this book, Nelson responded, "I hope readers will be inspired to go see the magnificent United States Marine Corps Memorial in Washington D.C. I hope readers will understand that heroes don't win every battle that they fight. Although Ira's story had a tragic ending, he was a courageous man who served his country well." S.D. Nelson lives in Flagstaff, Arizona.